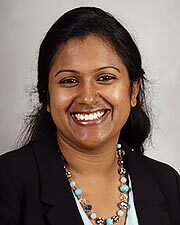 Dr. Bindu Akkanti is a board certified Physician and Assistant Professor at McGovern Medical School at The University of Texas Health Science Center at Houston (UTHealth). Dr. Akkanti’s clinical interests include diagnosis and management of critically ill patients in the Adult Critical Care Units at UTHealth. Her research interests include determining gene expression signatures in critically ill patients and in patients with advanced lung diseases utilizing bioinformatics resources. She enjoys teaching medical students, residents and fellows and was selected as the Chief Fellow during her final year of fellowship. She has assisted in development of multiple educational materials while in residency and fellowship to aid in graduate medical education. UTHealth has teamed up with 39 other health sites across the country to combat a life-threatening lung disease called pulmonary fibrosis.